Every woman dreams to have long and straight legs, slim hips, and no “breeches”. There is no woman without fat deposits, which are the common cause for irregular shape of the legs. Our aim with the legs liposculpturing pricedure is to remove these depots and thus achieve visual elongation and straightening of the legs. 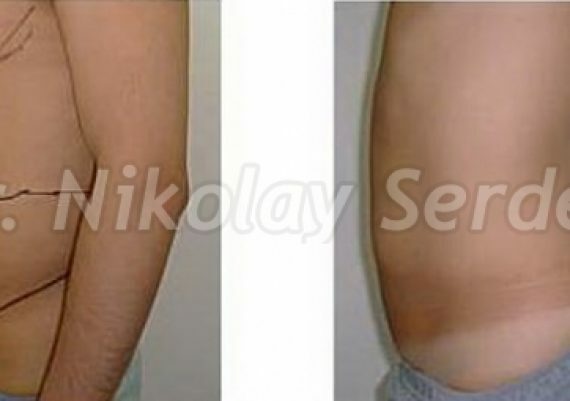 The best method for removing the fat depots is VASER ultrasound liposculpturing. It is a form of liposuction where we liquefy excess fat using sound waves, which are harmless to adjacent tissues. 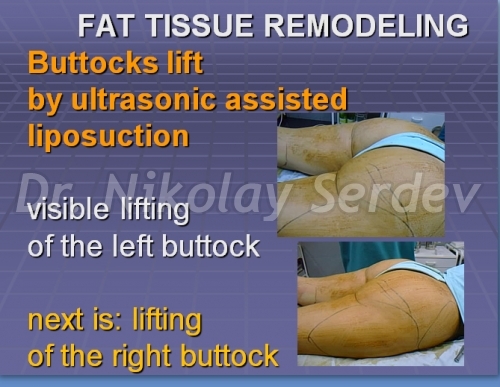 Removal of the liquefied fat tissue is done smoothly and without blood loss, under very low pressure. The fat cells cannot build up in the same places again, because they have been destroyed. Fat depots are not an age mark. Even young girls and models can rarely boast of perfect forms. The slimmer the model, the more visible the fat depost. Unfortunately, in addition to slimming, weight loss also leads to skin laxity. This is because fat cells inside the fat depots are created to transform non-burned calories into fat tissue. 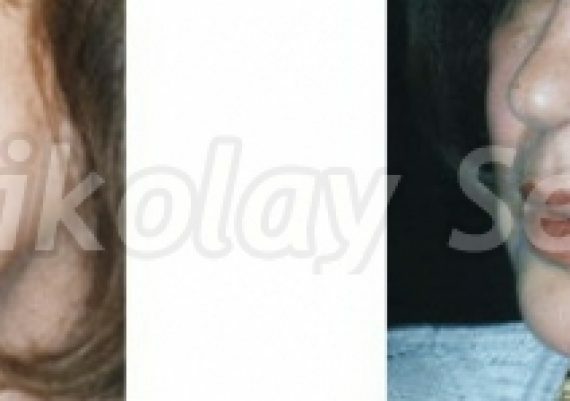 They increase in size unevenly and lose their connection to caplillaries. Imagine a house with a fountain in the yard. A huge building is built in place of the house and now the fountain is no longer sufficient to serve the needs of all residents. In analogy, when speaking of fat depots, caplilaries can no longer feed oxygen to the enlarged cells to start the process of breking down the accumulated fat tissue. To remove the fat deposits on the legs, we perform liposuction of the knees, breeches, love handles (where necessary), inner thighs, calves, and in some cases – ankles. Breeches are women’s bigger concern. Knees are the most common cause for the irregular shape of women’s legs. This is true even in young, skinny girls and selected fashion models. Even small fat depots on the inside of the knee curves visually shorten the legs and distort them to X-shape. Our job is to sculpture and model the convexity (projection) of the inner knee. The calf is shaped in the form of a bottle (equal form both sides). The form of the inner knee fat collection is moved higher, which elongates the calf. 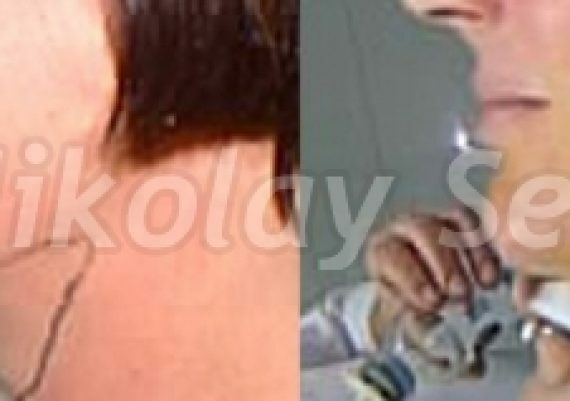 After the procedure, patients wear elastic garments for a month (during summer) or a month and a half (during winter). Dr. Serdev‘s method for legs liposculpturing, using VASER ultrasound liposculpturing (UAL), involves removing the projection of fat depots in the inner and lateral thighs (breeches), inner knees, as well as “love handles”. This leads to visual straightening and elongation of the legs. In some cases, we also have to shape the outer calves and possibly transfer fat to the inner calves, which makes them straighter. Removing fat from around the ankles is done in rare cases. When observed from behind, women’s legs look shorter. The buttocks are what determine the length of the legs when viewed from the rear and sides. Even in skinny girls, the buttock is not always in a high position and hangs, thus shortening the legs. We can achieve a visual elongation of the legs by sculpting the fat tissue and reducing the fat depots, especially under the gluteus muscles, around the thighs and hips. This leads to a smaller, lifted, “happy” buttock and visually elongated thighs. Moving the fat tissue form upward on the inner side of the knee creates visual elongation of the claves (“knee lift”). Secondary sculpturing of the knees is not necessary. The legs preserve their correct form even when patients gain weight. Straightening and elongating the form of the legs effectively alters the proportions in terms of elongating the entire silhouette. It improves the appearance and appeal of women, as well as their confidence. Liposclulpture of the ankles is a comparatively rare procedure. There are total of 4 fat depots – two in front and two in the back, but they are not always present at the same time. Thanks to the atraumatic and bloodless VASER UAL procudure, Dr. Serdev has perfected the ankle sculpturing method. The results improve as the swelling diminishes. After the procedure, we prescribe antibiotics for 5-7 days and painkillers for the first night (and after, if necessary). We do daily follow-up sessions for 3-5, sometimes up to 7 days, depending on the treated areas. These sessions include taking showering, disinfection, bandaging and change of elastic garments. The immediate result shows much better form of the legs, even when initial swelling is present. Swelling will be minimized in the next 3 months. The final result becomes better and better during the course of the first year. The greatest advantage of ultrasound liposculpture is that this method naturally leads to weight loss. Moreover, there are several additional positive effects – the skin tightens (ultrasound lifting effect), there is a natural activation of enzyme systems with consequent loss of appetite and weight loss to normal. The atraumatic nature of VASER UAL also makes possible to combine the legs lipo procedure with fat removal from other areas of the face and body, depending on patient characteristics. 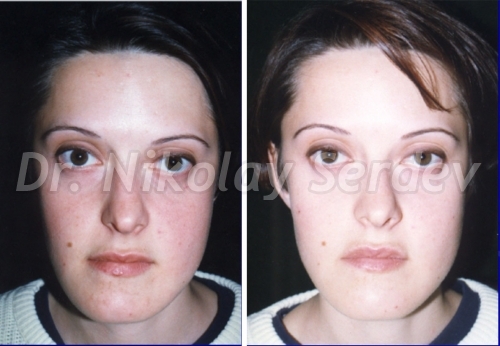 We can also do various liftings using scarless Serdev Sutures Lifting method. The excess of fat tissue accumulated in the lowe part of the face weighs on the skin and stretches it. This gives the face a “square” form and appearance, instead the youthful “V”-shape. In such cases, we can perform a face lipo procedure (liposuction of double chin and cheeks) to sculpt the lower part of the face and restore the angle between the chin and neck. 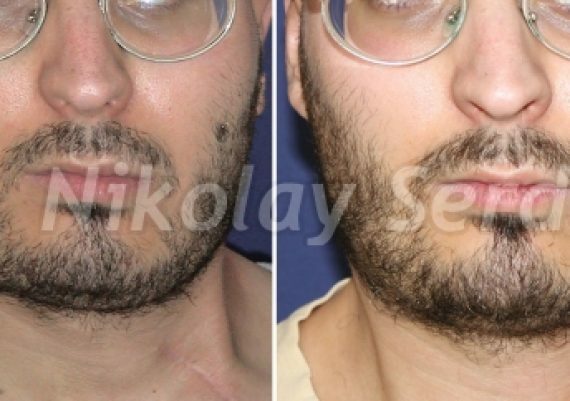 The procedure helps us eliminate the double chin, the jowline tightens as in young people. The best method for removing fat depots is VASER ultrasonic liposculptuing. It is a form of liposuction where we liquefy excess fat using sound waves, without harm to adjacent tissues. We thus make its removal under low pressure atraumatic and bloodless. 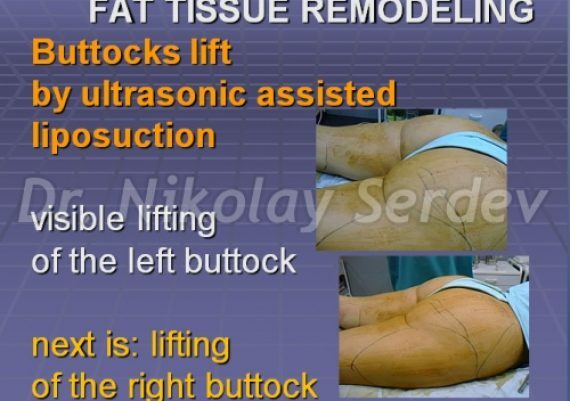 Fat depots cannot accumulate again in the same locations, because the ultrasound has destroyed them. The result of the face liposculpture is immediate and durable, but it becomes most apparent a few months after the procedure, due to swelling reduction. The skin tightens. From “round” or “square” with hanging cheeks, the face becomes “oval” or “V”-shaped, with “hungry” cheeks. There are no bruises and signs of intervention. After the procedure, we prescribe antibiotics for 5-7 days and painkillers for the first night (and after, if necessary). Sculpting of the double chin and cheeks can be performed as a standalone procedure, as well as before or simultaneously with mid-face lift (and/or lower face and neck lift). 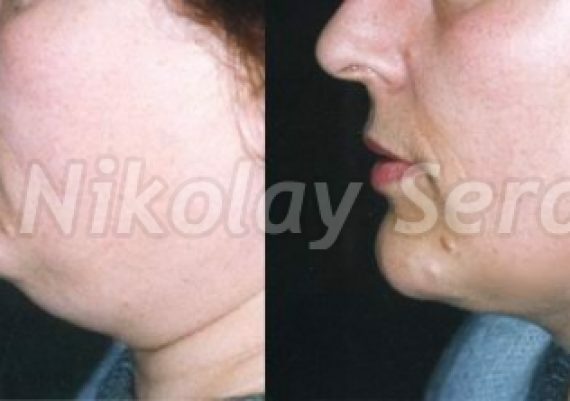 Liposculpturing of double chin is an atraumatic procedure without blood loss. Small bruises, low and in the front part of the neck, are extremely rare and appear in only 1 to 2 percent of all cases. After the procedure, we prescribe antibiotics for 5-7 days and painkillers for the first night (and after, if necessary). We place special plasters on the zones of liposculpture for the first night only. Since the skin in the double chin area is a low point, swelling can cause skin to unstick and sag during healing. This is the reason why after double chin lipo, patients must wear an elastic bandage for about a month. This bandage presses the skin so it heals onto the musculature. Patients must closely follow the doctors’ instructions, as they will lead to durable results. 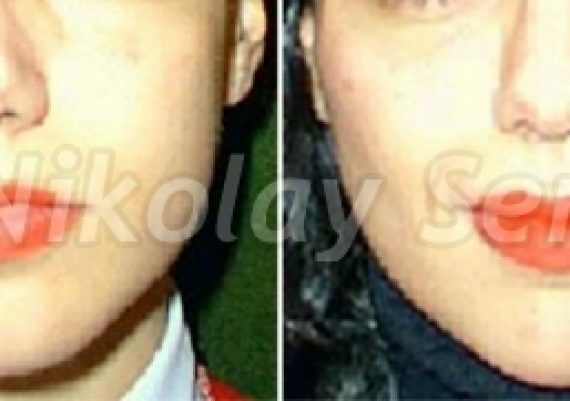 If we only do liposuction of the cheeks (lower part of the face), patients do not have to wear elastic bandages. They only wear a skin-colour tape during the first night to reduce the swelling. We most often do VASER liposculpture of the cheeks (lower part of the face) and double chin in the same time. During the days in the early post-op period, most important is the follow up for fluid retention or collection. In this way we prevent the formation of painful seroma and infection at a later stage. The procedure is carried out through skin punctures only. Due to its atraumatic nature, the face lipo procedure can be combined with fat removal from other areas in the same time, depending on patient characteristics, as well as lifting procedures via Serdev Suture methods.